How Long Can You Keep Canned Salmon? How Long Can Cooked Salmon Last Unrefrigerated? How Long Does It Take for Salmon to Spoil? 3 How Long Can You Keep Canned Salmon? 4 How Long Can Cooked Salmon Last Unrefrigerated? Freezing isn't the only long-term storage option for your freshly caught or store-bought salmon; you can also can it. Canned salmon will last up to one year without any refrigeration necessary. You'll need to use a pressure canner to properly preserve your salmon, though, because it is a low-acid food. Only a pressure canner can achieve the high temperatures needed to prevent the deadly bacteria Clostridium botulinum from growing in the jars. Prior to canning the salmon, remove the head, tail, fins, scales and internal organs. Completely rinse the fish under cool water, both inside and out, to remove any blood and slime. You don't need to bone your salmon; the bones become soft after the fish is canned and are a good source of calcium. Store your fish in the refrigerator at 40 F or below prior to canning so that it stays fresh. Thaw frozen salmon in the refrigerator prior to canning. Cut the salmon into chunks and pack the pieces into half-pint or pint-sized glass canning jars. While other types of fish need some oil to add moisture when packed, salmon is a fatty fish, and you don't need to pack it in any type of liquid. Leave 1 inch of head space at the top of each jar. Add salt and other seasonings such as pepper, garlic and herbs to your packed salmon to add some flavor. Place the self-sealing lids in a pot of hot water to warm the compound that will seal the jars. Wipe down the mouths of the jars with a paper towel moistened with vinegar to remove any fish residue and ensure a good seal. Place the lids on your jars of salmon and screw on the jar rings. Add 3 inches of water to your pressure canner and place the rack in the canner. Stack your cans of salmon in the canner and seal the canner's lid. Keep the canner's vent open, and heat the canner on high. Let steam escape from the vent for 10 minutes, and close the vent to pressurize the canner. Once the canner reaches 11 pounds of pressure on a dial gauge canner or 10 pounds on a weighted gauge canner, process the cans for 100 minutes. Lower the heat to maintain the pressure. If the pressure on your canner drops below these readings, begin timing again. Increase the pressure for higher altitudes. Allow your canner to depressurize to 0 for 45 minutes after turning off the heat. 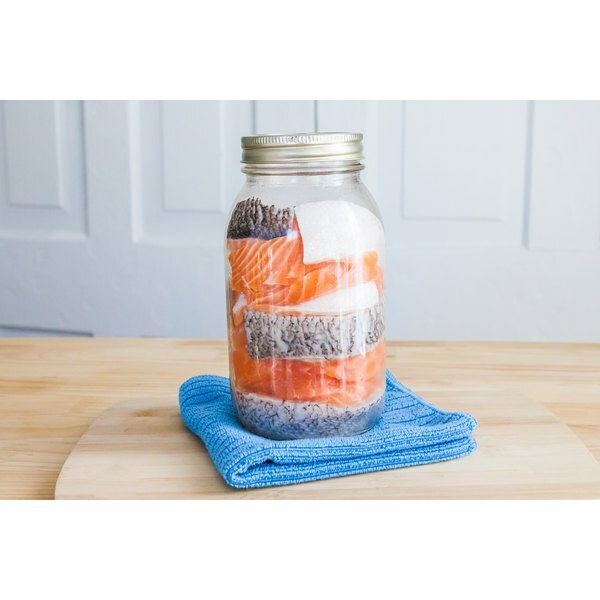 Take off the lid, and remove the jars of salmon with a lifter and place them on a towel in a cool, dark location. Allow them to cool for 12 hours. If the jars are properly sealed, the lids will not give when you push on them. 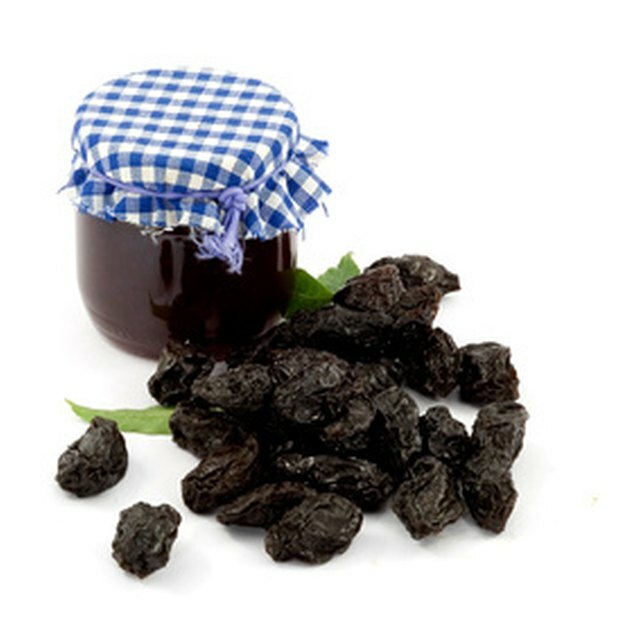 Reprocess improperly sealed jars. You can store the jars for up to 1 year in the pantry. Clear crystals that form in the canned salmon are normal and will dissolve when heated. Refrigerate opened cans of salmon for up to 2 days. If your can of salmon smells unpleasant or appears bubbly, boil the jar for 30 minutes and discard its contents to avoid poisoning yourself with botulism. How Long to Cook Canned Salmon in a Pressure Cooker? Are Sardines Healthy to Eat? Do Sardines Ever Go Bad? Can You Freeze Canned Goods?